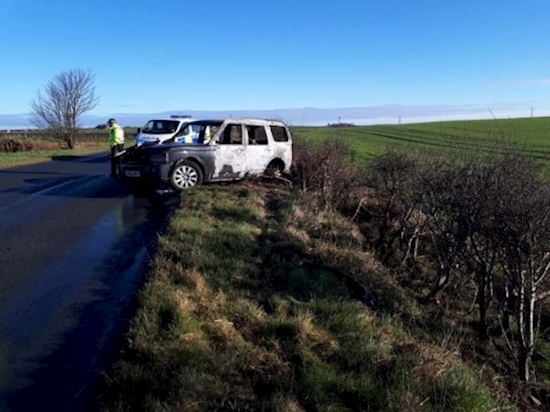 Police investigating the discovery of a burnt out Land Rover found on a north-east road have appealed for motorists with dash cam footage to come forward. The 4×4 was found in flames on the A981 Memsie to Fraserburgh road shortly after 6.20am on Saturday. Fire crews were called to the scene and managed to extinguish the blaze using a variety of equipment. The owner of the Land Rover Discovery urged anyone with information to contact the authorities. In a post on social media, he wrote: “If anyone saw my Land Rover on the go between 6.30pm last night (Friday) and 6.30am or if any local was walking their dog after 6.30pm and noticed the Land Rover still outside my house or dodgy people going about, let us know please. “Someone took the keys from my house and stole it. “They ended up crashing it heading for the Broch, coming from Memsie, and it either caught fire when it crashed or they torched it. Local sergeant Steven McDonald said officers were keen to speak motorists travelling along the road. He said: “We are keen to speak to anyone who saw a vehicle matching this description, particularly if you saw it on the A981 or anyone walking away from it on the carriageway.